WCF is Microsoft's unified framework for building service-oriented applications. It enables developers to build secure, reliable, transacted, and interoperable distributed applications. 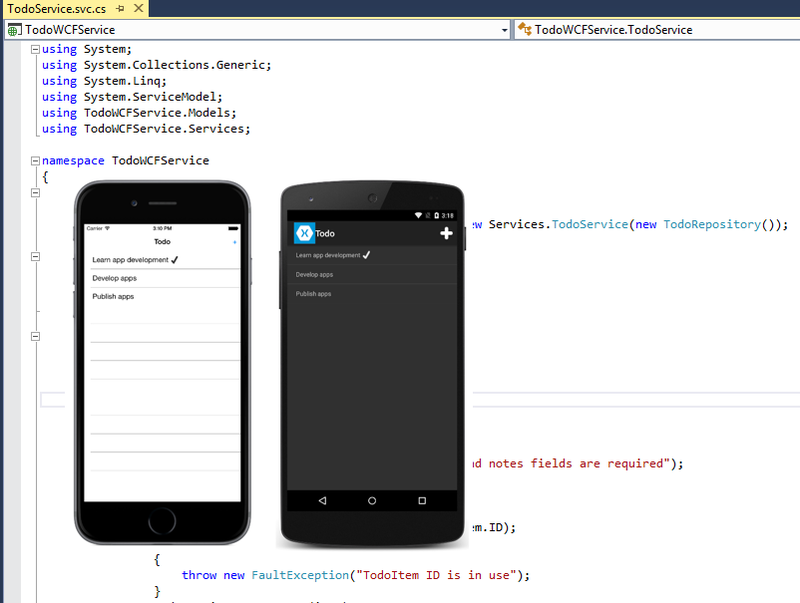 This article demonstrates how to consume an WCF Simple Object Access Protocol (SOAP) service from a Xamarin.Forms application. There are differences between ASP.NET Web Services (ASMX) and WCF, but WCF supports the same capabilities that ASMX provides – SOAP messages over HTTP. For more information about consuming an ASMX service, see Consuming ASP.NET Web Services (ASMX). The Xamarin platform support for WCF is limited to text-encoded SOAP messages over HTTP/HTTPS using the BasicHttpBinding class. WCF support requires the use of tools only available in a Windows environment to generate the proxy and host the TodoWCFService. Building and testing the iOS app will require deploying the TodoWCFService on a Windows computer, or as an Azure web service. Xamarin Forms native apps typically share code with a .NET Standard Class Library. However, .NET Core does not currently support WCF so the shared project must be a legacy Portable Class Library. For information about WCF support in .NET Core, see Choosing between .NET Core and .NET Framework for server apps. In iOS 9 and greater, App Transport Security (ATS) enforces secure connections between internet resources (such as the app's back-end server) and the app, thereby preventing accidental disclosure of sensitive information. Since ATS is enabled by default in apps built for iOS 9, all connections will be subject to ATS security requirements. If connections do not meet these requirements, they will fail with an exception. ATS can be opted out of if it is not possible to use the HTTPS protocol and secure communication for internet resources. This can be achieved by updating the app's Info.plist file. For more information see App Transport Security. For more information about the data model used in the application, see Modeling the data. A proxy must be generated to consume a WCF service, which allows the application to connect to the service. The proxy is constructed by consuming service metadata that define the methods and associated service configuration. This metadata is exposed in the form of a Web Services Description Language (WSDL) document that is generated by the web service. The proxy can be built by using the Microsoft WCF Web Service Reference Provider in Visual Studio 2017 to add a service reference for the web service to a .NET Standard library. An alternative to creating the proxy using the Microsoft WCF Web Service Reference Provider in Visual Studio 2017 is to use the ServiceModel Metadata Utility Tool (svcutil.exe). For more information, see ServiceModel Metadata Utility Tool (Svcutil.exe). The generated proxy classes provide methods for consuming the web services that use the Asynchronous Programming Model (APM) design pattern. In this pattern, an asynchronous operation is implemented as two methods named BeginOperationName and EndOperationName, which begin and end the asynchronous operation. The BeginOperationName method begins the asynchronous operation and returns an object that implements the IAsyncResult interface. After calling BeginOperationName, an application can continue executing instructions on the calling thread, while the asynchronous operation takes place on a thread pool thread. For each call to BeginOperationName, the application should also call EndOperationName to get the results of the operation. The return value of EndOperationName is the same type returned by the synchronous web service method. For example, the EndGetTodoItems method returns a collection of TodoItem instances. The EndOperationName method also includes an IAsyncResult parameter that should be set to the instance returned by the corresponding call to the BeginOperationName method. The Task Parallel Library (TPL) can simplify the process of consuming an APM begin/end method pair by encapsulating the asynchronous operations in the same Task object. This encapsulation is provided by multiple overloads of the TaskFactory.FromAsync method. For more information about APM see Asynchronous Programming Model and TPL and Traditional .NET Framework Asynchronous Programming on MSDN. The generated proxy class provides the TodoServiceClient class, which is used to communicate with the WCF service over HTTP. It provides functionality for invoking web service methods as asynchronous operations from a URI identified service instance. For more information about asynchronous operations, see Async Support Overview. The TodoServiceClient instance is configured with binding information and an endpoint address. A binding is used to specify the transport, encoding, and protocol details required for applications and services to communicate with each other. The BasicHttpBinding specifies that text-encoded SOAP messages will be sent over the HTTP transport protocol. Specifying an endpoint address enables the application to connect to different instances of the WCF service, provided that there are multiple published instances. For more information about configuring the service reference, see Configuring the Service Reference. This method simply creates a new TodoWCFService.TodoItem instance, and sets each property to the identical property from the TodoItem instance. This method simply retrieves the data from the proxy generated TodoItem type and sets it in the newly created TodoItem instance. The Task.Factory.FromAsync method creates a Task that executes the TodoServiceClient.EndGetTodoItems method once the TodoServiceClient.BeginGetTodoItems method completes, with the null parameter indicating that no data is being passed into the BeginGetTodoItems delegate. Finally, the value of the TaskCreationOptions enumeration specifies that the default behavior for the creation and execution of tasks should be used. The TodoServiceClient.EndGetTodoItems method returns an ObservableCollection of TodoWCFService.TodoItem instances, which is then converted to a List of TodoItem instances for display. The Task.Factory.FromAsync method creates a Task that executes the TodoServiceClient.EndCreateTodoItem method once the TodoServiceClient.BeginCreateTodoItem method completes, with the todoItem parameter being the data that's passed into the BeginCreateTodoItem delegate to specify the TodoItem to be created by the web service. Finally, the value of the TaskCreationOptions enumeration specifies that the default behavior for the creation and execution of tasks should be used. The web service throws a FaultException if it fails to create the TodoItem, which is handled by the application. The Task.Factory.FromAsync method creates a Task that executes the TodoServiceClient.EndEditTodoItem method once the TodoServiceClient.BeginCreateTodoItem method completes, with the todoItem parameter being the data that's passed into the BeginEditTodoItem delegate to specify the TodoItem to be updated by the web service. Finally, the value of the TaskCreationOptions enumeration specifies that the default behavior for the creation and execution of tasks should be used. The web service throws a FaultException if it fails to locate or update the TodoItem, which is handled by the application. The Task.Factory.FromAsync method creates a Task that executes the TodoServiceClient.EndDeleteTodoItem method once the TodoServiceClient.BeginDeleteTodoItem method completes, with the id parameter being the data that's passed into the BeginDeleteTodoItem delegate to specify the TodoItem to be deleted by the web service. Finally, the value of the TaskCreationOptions enumeration specifies that the default behavior for the creation and execution of tasks should be used. The web service throws a FaultException if it fails to locate or delete the TodoItem, which is handled by the application. In Visual Studio 2017 or Visual Studio 2019, you should be able to test the UWP application on a PC with no additional configuration. Testing Android and iOS clients may require the additional steps in this section. See Connect to Local Web Services from iOS Simulators and Android Emulators for more information. By default, IIS Express will not accept connections from external sources for security reasons. To enable connections from remote devices you must run IIS Express with Administrative permissions. The easiest way to do this is to run Visual Studio 2017 with Administrative permissions. This will launch IIS Express with Administrative permissions when running the TodoWCFService. With these steps complete, you should be able to run the TodoWCFService and connect from other devices on your subnet. You can test this by running your application and visiting http://localhost:49393/TodoService.svc. If you get a Bad Request error when visiting that URL, your bindings may be incorrect in the IIS Express configuration (the request is reaching IIS Express but is being rejected). If you get a different error it may be that your application is not running or your firewall is incorrectly configured. To allow IIS Express to keep running and serving the service, turn off the Edit and Continue option in Project Properties > Web > Debuggers. Customize the endpoint devices use to access the service. This step involves configuring the client application, running on a physical or emulated device, to access the WCF service. The Android emulator utilizes an internal proxy that prevents the emulator from directly accessing the host machine's localhost address. Instead, the address 10.0.2.2 on the emulator is routed to localhost on the host machine through an internal proxy. These proxied requests will have 127.0.0.1 as the hostname in the request header, which is why you created the IIS Express binding for this hostname in the steps above. The iOS Simulator runs on a Mac build host, even if you are using the Remoted iOS Simulator for Windows. Network requests from the simulator will have your workstation IP on the local network as the hostname (in this example it's 192.168.1.143, but your actual IP address will likely be different). This is why you created the IIS Express binding for this hostname in the steps above. Once you have configured the Constants.cs with the appropriate endpoints, you should be able to connect to the TodoWCFService running on your Windows 10 workstation from physical or virtual devices.